I’ve dreamt dreams in my life that have stayed with me ever after, and changed my ideas; they’ve gone through and through me, like wine through water, and altered the colour of my mind. 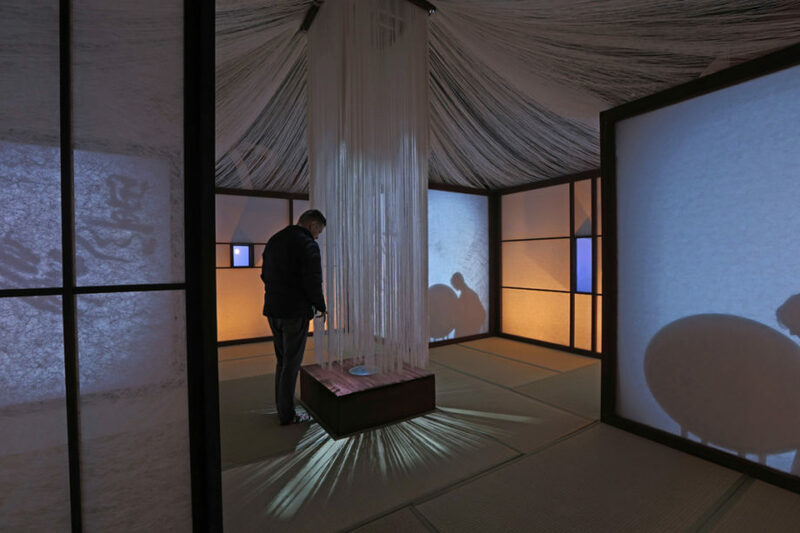 Stormy House is an Anglo-Japanese walk-in architectural, video and sound installation created by Whitestone Arts and 59 Productions in partnership with the Brontë Parsonage Museum and Bradford Theatre in the Mill. 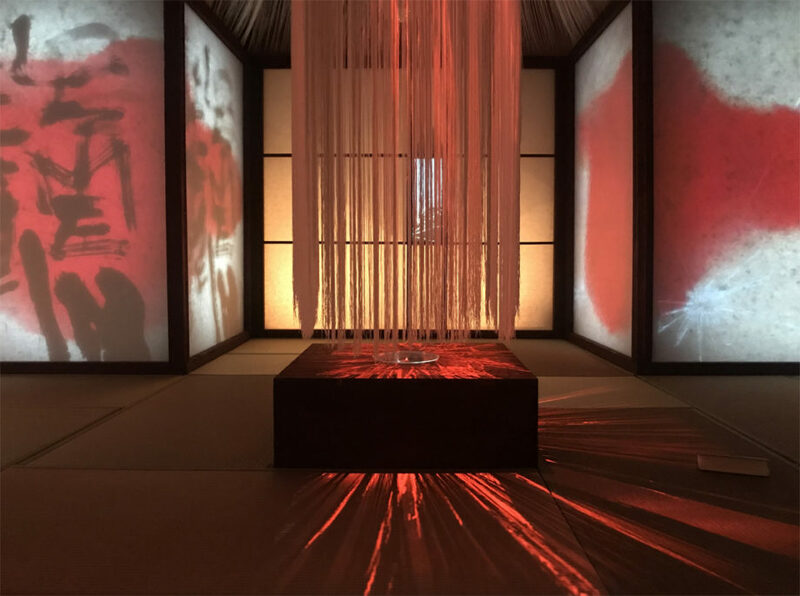 The installation immerses visitors in the gothic, ghostly elements of Emily Brontë’s novel Wuthering Heights (1848) through the lens of Japanese ghost tales – Kwaidan – collected and translated by polymath Patrick Lafcadio Hearn / Koizumi Yakumo and published after his early death in 1904. We have adapted three of the stories Kobayashi Masaki also selected for his iconic film Kwaidan (1964): ‘Black Hair’, ‘Woman of Snow’ and ‘In A Cup of Tea’, adding our own Goblin Spider story based on ‘Jorogumo’. Following the success of the installation’s premiere in November 2018 in Haworth, Whitestone Arts and 59 Productions are planning a national and international exhibition tour from 2019. 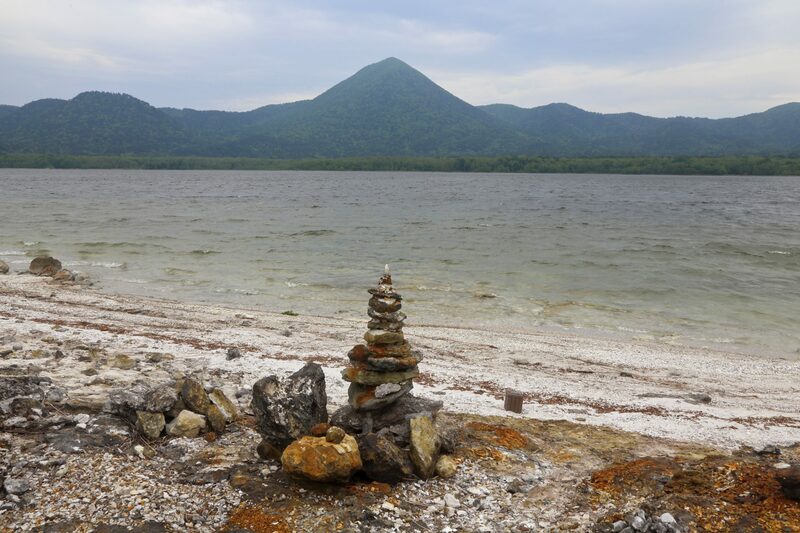 The 2020 Tokyo Olympics will encourage the world to focus on Japanese culture, topography, technology and art (as well as sport), making it a perfect time for touring this ambitious and unusual hybrid of Japanese mythology and Celtic gothic. 59 Productions evolved and recorded the multi-layered video content at Whitestone Arts’ studio on the edge of Haworth Moor, where Japanese butoh dancers, a performative calligrapher and a tea celebrant joined designers and artists from the UK to create scenes and characters for our narratives. 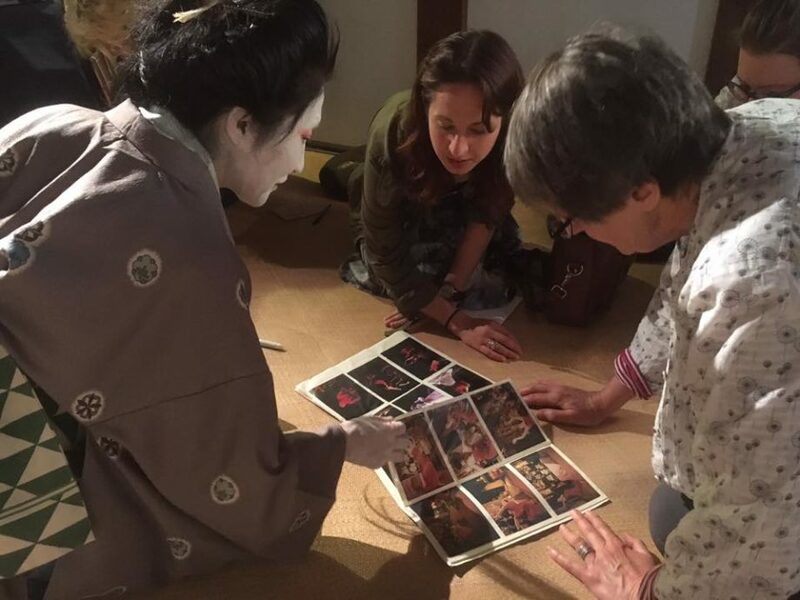 The collaborative nature of the project uncovered powerful cultural, landscape and literary connections uniting east and west. When we interpret another culture through our own lens, we bring the difference the other can bring… aspects that bridge the known with the strange. And it is the strangeness of the unknown (how it can re-arrange our perceptual field) that calls us to travel across the bridge of difference, after all. Then, when familiar territory is given up, the traveller can stand in a new familiar, in the place where worlds (and they are whole worlds) meet. As a child, Emily Brontë chose the explorer William Parry for her creative alter ego and (spookily) sited her imaginary world of Gondal as one of a group of islands in the North Pacific. Though there are many fictional and biographical connections between our two 19th century writers, none are stranger than this apparently random cartography. Emily’s immersive lifelong game of acting out complex, non-linear narratives for her male and female avatars in this imaginary world laid the foundations for her novel’s groundbreaking content, themes and structure. 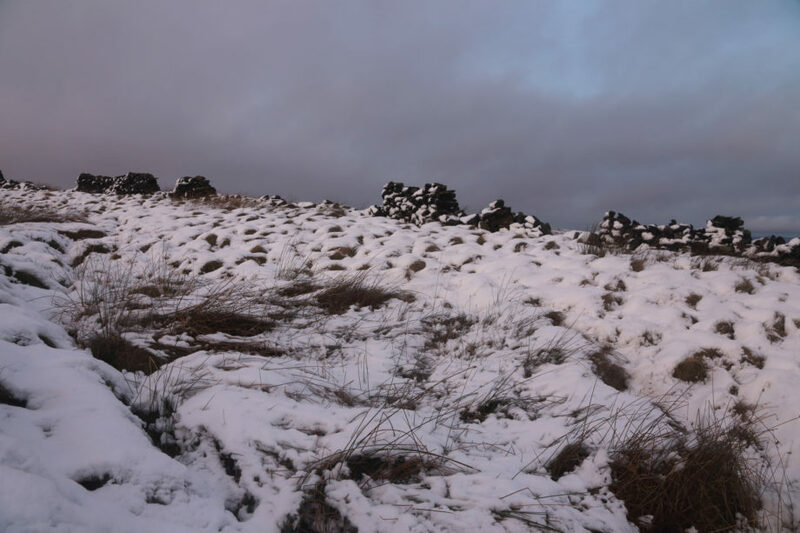 The (mainly snow-obscured) landscape of Wuthering Heights is a hybrid of Haworth Moor, rural Honshu and the passion-torn Queendom of Gondal. Within our Stormy House a spider weaves her threads over the ghostly silhouettes and a haunting lullaby based on narrator Nelly’s song from Wuthering Heights is sung by a dead mother returning from her grave to comfort her abandoned ‘bairnies’ and challenge the cruelty of the living. The song’s hypnotic variations frame and contain the visuals and text of our piece. Bram Stoker, Lafcadio Hearn’s fellow-Irish contemporary and creator of Dracula changed the world forever when his undead Count pressed his footprints in the mud of Whitby Harbour and began his hunt for the female soul. Brontë created a female undead, Cathy Earnshaw, hunting for her right to live whatever life she wishes. The audience is taken on a playful but deeply questioning journey of unfettered childhood imagination and elemental energies that generate new worlds from the old, until it becomes difficult to tell who is ghost and who ‘living’, who is victim and who the vampire? Will we never ‘Let the Right One In’? Emily’s and Lafcadio’s mothers were taken from them when they were very young. Cornish Maria Branwell Brontë died after giving birth to 6 children in 7 years. Lafcadio’s Greek mother was put in an asylum when his father (also Irish, like Emily’s father) tired of her. The works of both writers echo this profound loss. Celtic, Shinto and Greek myths mirror each others’ stories and share a strong belief that ghosts live, suffer and bleed beside us here on earth. At the centre of our own domestic and ghostly storm in a teacup is a void embedded in the world we call ‘real’. 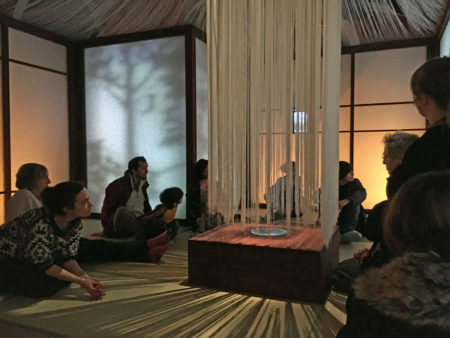 The Japanese call it ‘Ma’ (space) and in this installation it is the Absent Mother, Woman of Snow, Unholy Ghost, Mother Spider in the shadows. In the depths of the Dark House and shadows, we placed Woman, marking her as the whitest of beings – but only the face and hands. The teeth were painted black, the lips green-black, the eyebrows shaved. She was as a spectre: might not the darkness have emerged from her mouth and black teeth, from the black of her hair, like the thread from a great Earth Spider?